Thank you for understanding my absence for a few days! I just found out that I am able to share pictures with you all from the TLC Four Weddings shoot here, so be watching my instagram for sneak peaks, and then I will do several posts on it, as Savannah and I took about 600 pictures! Today though I have a really fun giveaway for ya! This girl makes the coolest, funnest jewelry I think and today she is giving away 2 bracelets to 2 My Sweet Savannah readers. 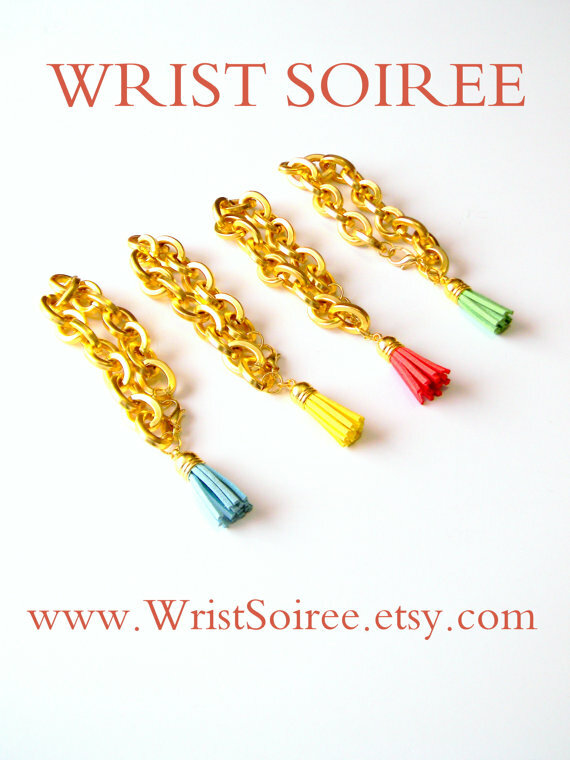 How would you like to win one of these fun tassel bracelets? They come in a variety of colors which you can see here. Super fun right? Ok, here is how you can win. Go to www.wristsoiree.com and then come back here and in the comments section, tell me which color you like. I will pick 2 random winners on Friday and announce back here. If you would like an extra chance at winning, please follow them on instagram @wristsoiree. And what the heck, for a third entry you can follow me on instagram, or this blog, either one. Just leave me a comment letting me know if you are a new follower either way! I have a link on the right to my instagram account, or you can search for me @mysweetsavannah. Just a reminder to be sure and leave your email address so I can contact you if you win! Very fun bracelet. I like the blue color. I love the green!! These would look so stinkin' adorable in a stack! Love! I would choose green, it's my fave! I like the lime one. The tassel is so cute! Thanks for the chance. I would choose mint. I love the IVORY best. I love the blue tassel bracelet the best. cute bracelets...would love to have one! cute bracelets!!! would love to have one!!!!! So hard to pick but I like the coral one and the white!!!! Navy- all day long! Thanks for the giveaway! So fun! I like the green! Thanks! I love the gray one! and I follow both of you on instagram! hooray! I love the navy one and the white one! Fuchsia sounds like me! Thanks love her shop! Love the grey tassel bracelet! The blue, coral or ivory are great. Hard to choose one! I love the navy one, have lots of navy in my wardrobe!!! Been a follower for several years, can't wait to see the TLC photos!! Would love the green one! Thanks for a great giveaway! Now following Wrist Soiree on insta! Now following you on insta, too! Oooh, they're so pretty! I love light pink or olive ~ thanks for the fun giveaway! I love these bracelets. 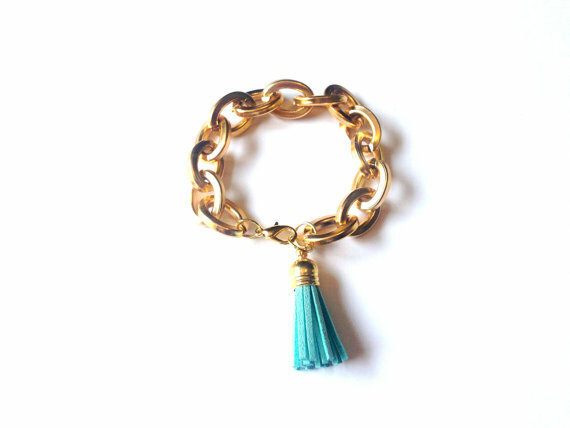 I have been wanting to get a gold bracelet that was classical, yet w/ a pop of fun.... the tassel is perfect. Oh I have to have the turquoise. I love the ivory bracelet, thanks! I really like the turquoise! Love the green or lavender!! These are so cute....I really like the aqua color!! Have followed you online for a bit but just followed instagram, I need ot use that more LOL. These bracelets are stunning, I adore them in all the colors! Thanks! Thank you for the giveaway! All the colors are so fun but I like the fuchsia the best. Love the aqua! So cute! Adorable bracelets! Makes me want to hit the links. ;) Lots of great colors though if I had my druthers, I'd go with navy. Thanks! and have been a email subscriber for a while. I love the tassel bracelets! My fave was the fuschia, but it is sold out, so my other favorite would be the ivory one. I agree that stacking several of them would be so gorgeous. I follow you on Bloglovin, but for some reason it would not let me post a comment........something about the "frame." So I just went to the internet and got your blog, then I was able to be here! Thanks, keeping my fingers crossed. I love these! I like the Orange color! Perfect for my new jacket! Following both My Sweet Savannah and Wrist Soiree on instagram. 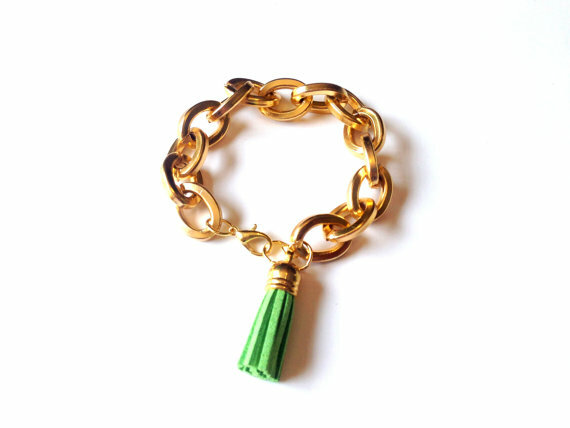 The tassle bracelet in green is my favorite! I follow Wrist Soiree on Instagram as well! I love the navy one! Second would be the olive. First choice navy with coral close behind. Really liked that they came in different wrist sizes. The green for sure! I have wanted a gold link bracelet for some time and with a tassel, just a cherry on top! i just started following wrist soiree on instagram!! Follow you on insta now! I like the ivory one! I love the cream one! i started following you on Instagram about a week ago! As much as I want to say black because it's classic... AQUA! Love love love the aqua!